Confusing the 1965 English tour with 1966 tour of the British Isles. That’ll teach me not to post late on Friday evening. If that’s all you have from Birmingham, what do you have from other shows? 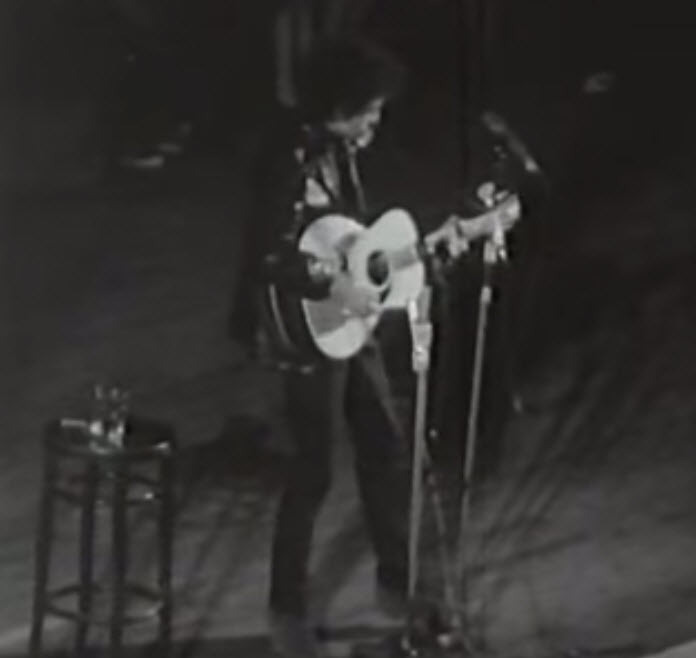 Edinburgh on Friday 20th May was the most extensively filmed of the tour, I remember, with Dylan “turning his back on the audience to play to the cameras filming for a US tv special for ABC tv ” according to contemporary Scottish press reports. Well it was an outtake from “Don’t Look Back” (“Eat the document” was about the 66 tour). I’ve seen the Film of “It’s Alright Ma” described as being from Leicester De Montfort Hall ! Never been to De Montfort Hall, but there is definitely a look of Birmingham Town Hall about the film. Was that the concert he started by running his finger along the floor and saying : “Dirt ! Dirt on the stage !” Where the second half was electric ; a large section of the audience protested by leaving ; and my friend, Bear, hollered out “I’m still here, Bob !! !” while I shrank with embarrassment next to him ? …second half electric certainly wasn’t Birmingham Town Hall in 1965. There was that sort of response at the 1966 concert in Birmingham (and others, I guess). If memory serves it was at the Old Odeon Cinema/Theatre in New Street. I was there ! In the audience at the Town Hall Birmingham. Great footage, why’ve I never seen that before? Anything else from that show? You were there! Lucky man!